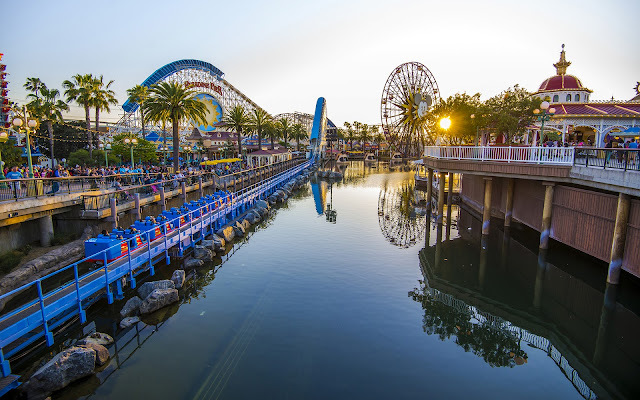 Last Friday afternoon, I was wandering around Disney California Adventure, wondering what would be the best place to shoot during magic hour, as the sun was heading down low, that I hadn't taken pictures of recently during this time. I mentally racked my brain for some place where the sun wouldn't already be impeded by obstructions, when all of a sudden, I realized I had walked around to Paradise Pier. Looking west, I realized I had my answer--a beautiful light cast across the entire bay, and sunbeams peaking back at me through the trees. What a sight it was! I knew I had to capture it, and so I did. The sun sets on Paradise Bay, bringing forth a golden glow across the entire area.